POLST: Physician Orders for Life-Sustaining Treatment. When and why should you complete this form? Dr. Susan Tolle answers these questions. She founded the Oregon Health & Science University Center for Ethics in Health Care and has directed it since 1989. 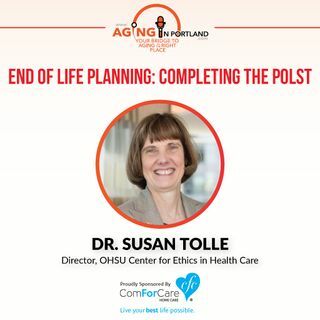 Tolle has shepherded its growth into a now internationally recognized ethics center with programs such as the Physicians Orders for Life-Sustaining Treatment (POLST) Program and, more recently, the Oregon POLST Registry. She is a ... See More practicing internist of General Medicine and Geriatrics at OHSU.